Marshall linebackey Donyae Moody wraps up Florida Atlantic running back Kerrith Whyte for a tackle during the second half of Saturday’s Conference USA football contest in Huntington, W.Va.
Marshall tight end Armani Levias (15) delivers a stiff arm to a FAU defender during the second half of Saturday’s Conference USA football contest in Huntington, W.Va.
HUNTINGTON, W.Va. — The Herd was feeling festive on Homecoming. 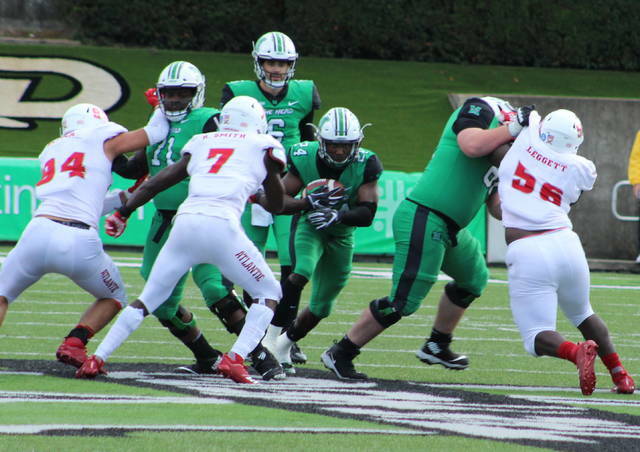 The Marshall football team forced five turnovers, churned out 233 rushing yards and received an early Christmas present late in the third quarter en route to a 31-7 thumping of visiting Florida Atlantic in a Conference USA contest on Saturday at Joan C. Edwards Stadium in Cabell County. 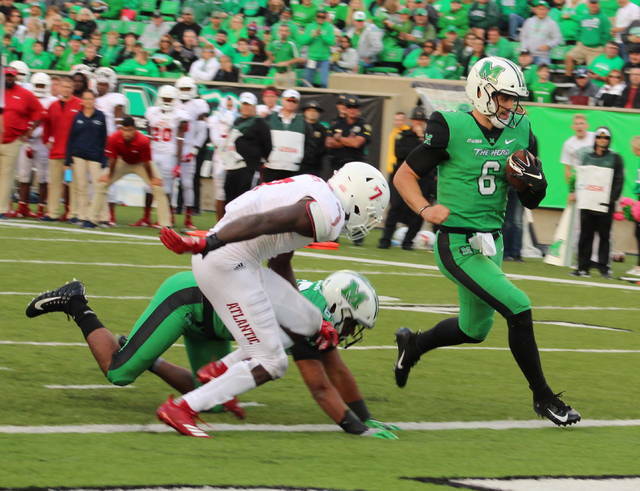 The Thundering Herd (5-2, 3-1 CUSA East) found themselves in a 7-3 hole less than five minutes into the second quarter, but the hosts reeled off 28 unanswered points over the final 33-plus minutes to snap a two-game losing skid at home. Clinging to a 17-7 advantage midway through the third period, the Herd — who had already forced four turnovers at that point — received somewhat of a gift from the Owls (3-4, 1-2) at the 6:24 mark. Facing a fourth-and-1 at its own 13-yard line, FAU decided to roll the dice and go for it — but a swarm of MU defenders were there to bottle up running back Kerrith Whyte for no gain — forcing a turnover on downs while retaining possession at the 13. One play later, the Green and White extended their lead to 24-7 as Alex Thomson found tight end Armani Levias on a 13-yard touchdown catch-and-run at the 6:18 mark … and the rout was on. Thomson added a 3-yard scamper with 1:35 left in regulation, capping a 5-play, 70-yard drive that wrapped up the 31-7 outcome. Marshall — which forced two interceptions in each half to go along with a second quarter fumble recovery — yielded 10 points from those turnovers. The Herd also had the first of three missed field goals in the contest midway through the opening frame. 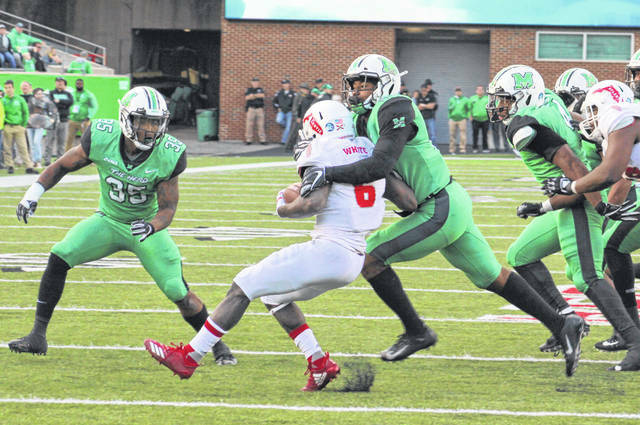 Marshall’s defense proved to be the difference-maker, particularly against FAU running back Devin Singletary — the reigning Most Valuable Player in Conference USA. Singletary was limited to 39 rushing yards on 16 carries and did not have a single reception. MU also recorded two sacks and seven tackles for loss while holding the Owls to 119 yards on the ground. Florida Atlantic ended up outgaining the Herd in total yards by a 359-335 overall margin, but the hosts benefited from solid field position after three takeaways led to drives starting in FAU territory. Ninth-year MU head coach Doc Holliday noted that his troops owned the day against a talented FAU squad that was averaging 34.7 points per game coming in. He also acknowledged that it was positive momentum headed into a much-needed bye week. After a pair of punts to start the game, MU came up empty on its second offensive series as Justin Rohrwasser had a 40-yard field goal partially blocked by Jalen Young — keeping the game scoreless at the 5:53 mark of the first. The Owls strung together a 6-play drive that ultimately ended when Artis Johnson picked off a Chris Robison pass inside Marshall territory and returned it to the FAU 23. The Herd ultimately gained nothing over three plays and settled for a 40-yard field goal from Rohrwasser, giving the hosts a 3-0 cushion with 14:23 remaining in the half. Florida Atlantic, however, answered with an 11-play, 82-yard drive that ended with Robison finding Harrison Bryant on a 2-yard touchdown pass, making it a 7-3 lead for the Owls with 10:52 left. 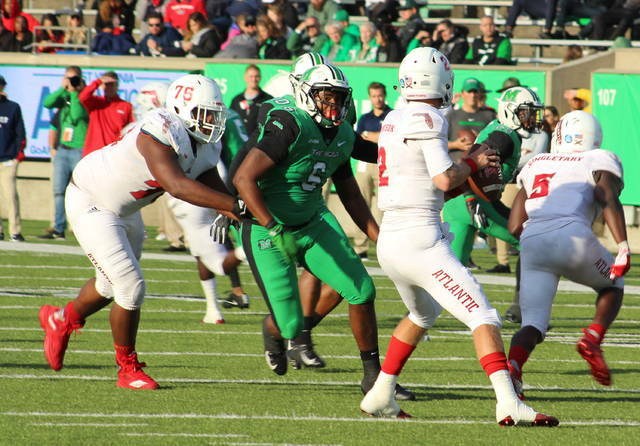 After consecutive punts on its next two offensive drives, Marshall took advantage of good field position on its next series after starting at the FAU 43. The Herd covered the distance in four plays as Alex Thomson found Armani Levias for a 29-yard catch-and-run touchdown that gave the hosts a permanent lead of 10-7 with 3:26 left in the half. Florida Atlantic opened the second half with possession, but the third play of the drive resulted in a Malik Thompson interception that gave MU the ball at the guests 27-yard line. Three plays later, Tyler King rumbled 17 yards to paydirt while building a 17-7 advantage with 13:52 remaining in the third stanza. Florida Atlantic’s next drive resulted in a 30-yard field goal miss from Vladimir Rivas, followed by the loss-of-down drive and another Rivas miss from 31 yards out — all coming in the third quarter of play. FAU ended its final six drives with four punts, an interception and a turnover on downs. 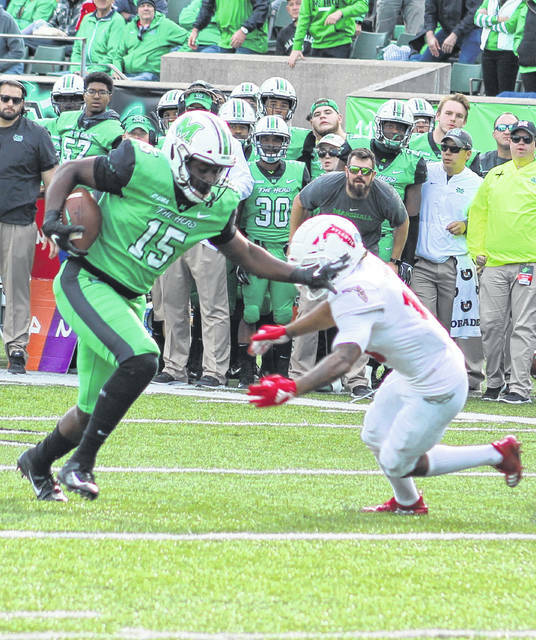 The Herd claimed an 18-16 edge in first downs and held the Owls to 3-of-17 on third down conversions. The hosts were also 4-of-5 in the red zone, while FAU went just 1-of-3. King led the MU ground attack with 125 yards on 21 carries, with Keion Davis adding 60 yards on 10 attempts. Thomson also churned out 50 yards on 16 totes and went 13-of-24 passing for 102 yards, including two scores. Tyre Brady led the wideouts with five catches for 41 yards, with Levias adding 47 yards and two scores on three grabs. Johnson led the Herd defense with 10 tackles and had an interception. Thompson was next with nine tackles and also had a pick, with Malik Gant also picking off a pass and making eight stops. Chris Jackson also had a pick, while Kereon Merrell recovered a fumble. Whyte paced the Owls with 40 rushing yards on 10 carries, while Robison added 31 rushing yards to go along with an 18-of-35 passing day that resulted in 223 yards, a score and four interceptions. Jovon Durante led the guests with 114 receiving yards on seven catches. Andrew Soroh and Rashad Smith paced the FAU defense with 13 and 12 tackles, respectively. Florida Atlantic recorded three sacks and had seven tackles for loss. The Herd is now 5-1 all-time against the Owls, including 3-0 at Edwards Stadium. 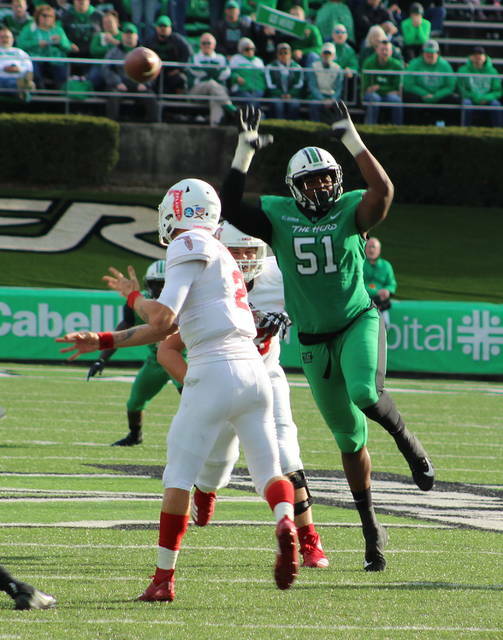 Marshall’s next contest will be on Saturday, Nov. 3, when it travels to Hattiesburg for a Conference USA clash with Southern Mississippi. Kickoff is scheduled for 3 p.m.